One of the most effective, safest, and most practical methods of getting rid of fleas from your dog is using a dog flea comb. These contraptions may look like your ordinary comb, but they’re designed specifically to do one thing – to sift through your dog’s coat and remove flea eggs and adults that may be present on the skin. Unfortunately, not all flea combs are created equal. We’ve searched the market and consulted with our resident vets to zero-in on the best dog flea comb. Here are the results of our exhaustive search. 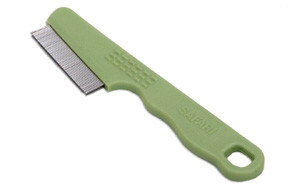 A great number of pet parents agree that the Safari Flea Comb with a Double Row of Teeth is one of the best when it comes to removing fleas from their beloved hounds. From the name of the item itself, the Safari features two rows of very fine, tightly-spaced stainless steel pins that have slightly rounded edges to make sure you will not be hurting your dog. The dual row design of the Safari allows for more efficient removal of flea adults and eggs as well as debris and other particles that may be present on your dog’s skin. On the other hand, the double row of teeth can somehow obscure one’s view of what one is actually combing from the dog’s skin. Nevertheless, being able to remove fleas and other nuisances takes precedence over obscured views. Measuring a full 8.3 inches from tip-to-tip, the Oster Comb for Your Dog Flea Comb is definitely one of the largest we’ve seen so far. This should be perfect for small to medium sized dogs, although we’re pretty sure using it on a large or giant breed is simply pushing it. Like all worthy dog flea combs, the Comb for Your Dog comes with tightly-spaced teeth made of metal pins with pet-safe rounded tips. The handle has grooves that help keep it in your hands while busy looking for fleas on your dog. Some pet parents actually use the Comb for Your Dog in grooming their pets especially in area around the mouth and eyes. The trick in removing fleas off of your dog is to always start with a large-toothed comb to part the hair a lot more efficiently. Once you’re done with this you can start using a fine-toothed comb to start removing fleas and debris. Instead of having 2 different combs you may want to get the LilPals Double Side Comb. As the name suggests you’ll get both a large-toothed comb and a fine-toothed comb in a single device. The handle is rounded so it fits snuggly on the palm of your hand, allowing for more precise control. At any rate, you’ll be using its large-toothed comb more often for general grooming purposes. The instant you see specks on your dog’s skin, simply use the fine-toothed attachment and you’re basically done. The ultra-fine metal pins of the Pet Republique Dog & Cat Flea Comb is one of the best when it comes to removing fleas, ticks, mites, dandruff, and anything else on your dog’s skin. Its design is also intended for managing knots, mats, and even excess shedding in dogs so you get a great all-around flea and grooming comb. The textured grip also allows for precision control while the slightly curved comb body allows for easier maneuvering through your pet’s coat. Pet Republique says that it has carefully constructed its bristles to be gentle on your pet’s skin but tough on fleas and dirt. Pet parents tend to believe in such claims; otherwise, the company won’t issue a 100% satisfaction guarantee. SunGrow’s Flea Comb for Cats, Dogs, and Small Pets deserves a spot in this list because of its adorable, ergonomic design plus really-tight spaced comb bristles. Forming the flea-removing mechanism of the SunGrow are heavy-duty stainless steel pins that are slightly rounded at the tips so they don’t hurt your pet. Unfortunately, it may not really work that well on bigger pets since the SunGrow is a tad small. You can still use it, of course, but you’d have to work in sections and that will definitely lengthen the process of removing fleas. Nevertheless, its exceptional design makes it a good flea comb to use on your young hound. The MECO Toothed Flea Comb looks more like the elaborate comb that Chinese brides receive on their wedding to give credence to the expression “Bai tou xie lao”, except that the MECO doesn’t come with any ornaments. Instead, it resembles a scraped with dutifully-attached 13-mm long teeth on one edge. The textured handle provides for non-slip grip while the stainless steel pins are sturdy enough to sift through your pet’s coat for adult fleas and eggs. Unfortunately, there have been issues about the quality of the product. Still, the MECO makes for an interesting flea comb especially if you’re on a really tight budget. Flea combs are important tools in the ongoing fight to remove fleas from our lives and that of our dogs. Choosing the right flea comb means understanding what these gadgets really are, when they should be used, how they are used properly, and the other ways in which fleas can be removed. A flea comb is a special type of comb that is primarily designed to remove, as the name implies, fleas most especially adults and eggs. Because these ectoparasites are very small and they tend to hide deep in your dog’s coat, a flea comb should have at least 30 teeth or bristles per inch of the comb’s length. For example, if you have a 4-inch long comb, excluding the handle, then you need to have at least 120 teeth running the entire length of the comb. When it comes to the length of the teeth, different manufacturers will have different teeth lengths. Some can go as long as three-quarters of an inch, although there may be some products that are longer. The problem with extra-long bristles is that the pins can flex as the comb is run across the dog’s skin. 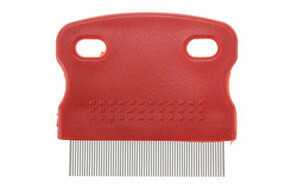 This can hurt the dog or it can damage the individual bristles of the comb. If the bristles are too short, they may not work well on dogs with extra-thick fur. Dog flea combs should always be used when you want to remove adult fleas from your pet. These should also be used if you want to determine and establish the presence of tiny, black specks that are actually flea dirt. Lastly, dog flea combs should be used if you want to remove this flea dirt as well as flea eggs. Flea combs are used whenever you suspect your dog has fleas. Ideally, you should comb your pet using this kind of gadget as often as necessary. However, you should also consider your dog’s tolerance. You can treat such combing sessions as a time for bonding with your pet. If you live in an area where flea infestation is commonplace, daily dog flea combing is recommended. If not, then you can perform a once-weekly combing of your pet. As an added precaution, every time your dog heads outdoors especially in wooded or grassy areas, you may also want to comb its coat for fleas immediately after returning from its outdoor adventures. How Do You Properly Use a Flea Comb on a Dog? Combing your dog for fleas is quite different from combing it for grooming purposes. Here’s how to properly use a flea comb on your dog. Always start combing your dog’s coat with a regular-toothed comb to make sure there are no tangles in your pet’s fur. Prepare a container filled with hot water and mixed with lemon-based dishwashing liquid for dumping the fleas that you’ll remove from your dog. Comb your dog outside your home to prevent fleas from jumping off of your dog and into your carpet, furniture, and other indoor items. Enlist the assistance of a family member to hold and soothe your pet while you begin combing for fleas. Always start at your dog’s head and neck region and work your way towards its back and tail. Work methodically but gently and always move the flea comb in the direction of your dog’s fur growth. 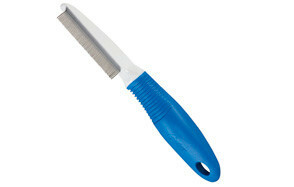 Don’t wait for the flea comb to be filled with flea or debris. If the comb is starting to fill up with particles, remove these and throw them in the container. Don’t forget to work on the chest, back, belly, and sides before finally combing the legs and paws and terminating with its tail. Pay close attention to your dog’s belly, tail, and under its chin as these are the areas where fleas are commonly found. Once you’re done, leave the soapy hot water for about 15 minutes to make sure fleas are dead before flushing it in the toilet. In case you combed your dog indoors, don’t forget to vacuum the area where you worked. Aside from using flea combs to remove fleas from your dogs, there are other options that you may want to consider. For instance, flea medicines have been proven effective in killing fleas including adults, eggs, and larvae. These can come in the form of topical spot-on applications that may have to be applied once a month. There are also oral formulations that can last up to 3 months. Flea medications kill fleas that are present on your dog and they also emit a scent that is quite noxious to these pests that they don’t want to go anywhere near your dog. There are also flea collars that work as repellents. Some products can also kill adult fleas and provide long-lasting protection for up to 8 months, with some even extending up to 9 months. These collars are embedded with insecticides that are safe for your pet but are very nasty against fleas. Flea sprays can also be used in the removal of fleas especially on various surfaces both in and outside of your home. Many of these contain natural ingredients that are toxic to fleas but are completely harmless for your pet. Of course, there are also products that contain commercial-grade insecticides for a more efficient extermination of fleas. Environmental control has always been an integral component of effective flea management. This typically includes frequent thorough cleaning of your house including the washing in hot water of the various items that your dog has been in contact with. Vacuuming the floors and other surfaces in the house can also help get rid of adult fleas, eggs, larvae, and even pupae that are hiding in crevices, small cracks, and other hard-to-reach areas inside the house. The removal of organic material from your yard can also help as flea larvae typically feed on organic matter. Pest-proofing your property also helps since fleas are known to live in other animals like squirrels, rodents, and other creatures that may venture into your backyard through openings in your fence. Using flea combs remains one of the most trusted ways of removing fleas from dogs in a safer and more efficient manner. While the process may be tedious you’ll find comfort in the fact that you’re not exposing yourself and your dog to chemicals that may be present in other flea control methods.